This ASCD Study Guide is designed to enhance your understanding and application of the information contained in Neurodiversity in the Classroom: Strength-Based Strategies to Help Students with Special Needs Succeed in School and Life, an ASCD book written by Thomas Armstrong and published in December 2012. You can use the study guide before or after you read the book, or as you finish each chapter. The study questions provided are not meant to cover all aspects of the book but, rather, to address specific ideas that might warrant further reflection. Most of the questions contained in this study guide are ones you can think about on your own, but you might consider pairing with a colleague or forming a study group with others who have read (or are reading) Neurodiversity in the Classroom: Strength-Based Strategies to Help Students with Special Needs Succeed in School and Life. Investigate the historical circumstances surrounding the evolution of special education in the United States over the past 50 years. Which events do you consider particularly significant during this period of time? Why? Compare the practice of differentiated instruction with the idea of "positive niche construction" described in this book. What are the similarities and differences between the two concepts? What are the educational implications of using a "rain forest" metaphor for the brain rather than a "machine" or "computer" metaphor? Discuss the idea of what it means to be "normal" in our society. Describe the kind of person that one typically associates with being "normal," or alternatively, argue for the difficulty or even impossibility of characterizing someone as "normal." Explore a strength-based approach to learning, such as Howard Gardner's theory of multiple intelligences, Dunn and Dunn's learning styles model, Search Institute's Developmental Assets framework, Gallup's StrengthsExplorer, the Myers-Briggs Type Indicator, or the Epstein Strength Based Assessment. How do you see this approach contributing to a better understanding of students with special needs? Investigate the artistic strengths of students in your classroom or school who have learning disabilities. Note whether artistic approaches to learning and teaching work especially well with these students. Do you see any clear patterns linking learning disabilities (especially dyslexia) with artistic ability? Read some of the original research articles cited in this chapter on the assets of students (and adults) with learning disabilities. What are the strengths and limitations of these studies? Describe a research study that you'd like to see done in this field. Explore in depth the life of a famous individual with learning disabilities (one source to help you get started is the online Yale Center for Dyslexia and Creativity). What were the positive influences that allowed this person to flourish in spite of (or perhaps because of) his or her diagnosis? Choose one literacy-based technological application (e.g., Dragon Naturally Speaking) and use it with one or more students who have learning disabilities. How does this technology allow students to sidestep their writing difficulties and become more fluent and productive in their writing? Develop a lesson plan or curriculum unit for your class that integrates highly visual-spatial or multisensory strategies with reading or writing skills. Do students with learning disabilities have greater success with this approach than with more traditional paper-and-pencil methods of teaching? Develop an action research project that would allow you to compare both approaches. Observe a student who has been identified as having attention deficit hyperactivity disorder (ADHD) in a number of different school settings (e.g., in a classroom during a test or hands-on activity, out on the playground during recess, in a physical education program, in an art class). Do this student's ADHD symptoms change from one setting to another? In which setting(s) are the symptoms most pronounced? In which are they least pronounced? What can you conclude from your observations about the type of learning environment that seems to work best for this student? Explore the connections between creativity and ADHD. Observe students with ADHD in your classroom or school, and look for instances of creativity at any point during their school day. Document your observations (e.g., through an anecdotal journal, work samples, video of student engaged in learning). What sorts of creative learning activities could you design and implement that might increase opportunities for these students to demonstrate creative behaviors? Develop a "short attention span" lesson plan for all the students in your classroom that involves frequent "state changes" (e.g., a 30-minute reading lesson where students read for 10 minutes, share what they've read with a partner for 3 minutes, draw a picture of the main idea for 5 minutes, participate in a whole class discussion for 5 minutes, and role play what they've learned for 7 minutes). Do these frequent changes in activities increase or decrease the level of engagement or performance of students in the classroom diagnosed with ADHD? What did you learn from this experiment that can be incorporated into future lesson plans? Find a computer software program or application that teaches reading or math skills using colorful, dynamic, self-paced, and interactive features (e.g., the Fast ForWord reading program). Use the program you have chosen with one or more students with ADHD in your classroom or school. How do the students' levels of engagement and performance compare with their learning during a standard classroom reading lesson where students listen to teachers' lectures and do written assignments at their desks? Put together a list of software programs or applications that seem especially suited to the high stimulation/high novelty needs of students with ADHD. Investigate the life and works of animal scientist Temple Grandin, who has autism. Sources might include the HBO movie on her life, books she has written, news articles about her life, or the 2010 TED lecture she delivered, among others. Although Grandin's life is not typical for a person with autism, what can you learn from her life story that might help improve the learning experience of students in your classroom or school who have been diagnosed with autism spectrum disorder? Investigate the gifts and talents of one or more students in your classroom or school who have autism. In particular, note whether they have an enhanced perceptual ability to pay attention to small details, whether they engage particularly well with systems (e.g. a structured schedule, mathematical or mechanical systems), whether they have particularly strong interests, and whether they possess strong visual-spatial skills. Document your observations. Write about how these students' gifts might be better utilized in a classroom or in the school as a whole. Investigate the DIR/Floortime model, an approach designed to help students with autism communicate and socialize more effectively with others (e.g. read Engaging Autism by Stanley Greenspan and Serena Wieder, investigate online resources, watch a DVD of the model being used). What can you learn from this method that might be useful to you in improving the socialization skills of students in your classroom or school who have autism spectrum disorders? Provide one or more students in your classroom or school who have autism with a tablet or smart phone that includes applications designed to help them with communication or socialization skills. Investigate online which applications are most useful and popular for these purposes, and then implement one or more of these applications with this student. What changes do you see in the behavior or learning performance of students as a result of using this technological tool? Read one or more articles in the special issue of the Disability Quarterly on "Autism and the Concept of Neurodiversity" (available online at: http://dsq-sds.org/issue/view/43). What does this material reveal about the emerging attitudes of individuals with autism regarding differences versus disabilities? Create a multimedia curriculum unit on people with intellectual disabilities who have succeeded in life (e.g. written books, played in musical groups, performed well in sports). Show this presentation to all the students in your classroom or school, and then have time available for students to ask questions and share their own reflections. What effect does this presentation have on students' attitudes about individuals with intellectual disabilities? Provide a student with intellectual disabilities who has articulation or communication difficulties with an iPad or other tablet and the application Proloquo2go (or a similar application). How does this new technology help the student communicate more effectively with his or her peers and teachers? What effect does this new technology have upon the student's engagement and learning performance in the classroom? Implement a Best Buddies or Circle of Friends program in your school. What effect does this program have on the peer relationships of students with intellectual disabilities? How does the program affect the lives of typically developing students who are involved? Are students with intellectual disabilities fully included in the regular classroom at your school? If so, what interventions have been particularly helpful? If not, what interventions could be instituted that might make it easier for these students to be fully included? Design a lesson plan for all your students that involves dramatic improvisation or role play in some form. Encourage your students with intellectual disabilities to become involved in this activity in a significant way. Does the participation of these students enhance the activity? If the lesson plan is successful, develop other lesson plans that include dramatic expression as a key component. Do you feel that students with emotional and behavioral disorders should be included in the regular classroom? Why or why not? What specific interventions or implementations do you think would make the inclusion of these students more likely to occur and result in more successful outcomes? Implement an expressive arts program or a series of expressive art activities in your classroom or school that includes one or more of the following: open-ended creative writing, painting, clay work, drama, musical expression, and creative movement. Do your students with emotional and behavioral disorders seem to constructively channel their energies into these activities? Do you observe special gifts in individual students with respect to one or more of these modalities? Explore the "wraparound" approach to meeting the needs of students with emotional and behavioral disorders. What aspects of this approach are already being implemented in your school? How could this approach be further expanded to help these kids positively deal with their problems and issues? Apply specific strategies designed to improve your rapport with a student in your classroom or school who has an emotional or behavioral disorder (e.g. greeting student at door, asking about his or her day, listening to his or her problems). How does this improved rapport seem to affect the student's engagement or performance in school? Visit a school in your area that practices full inclusion of students with special needs. What can you learn about that school that will help you implement inclusive practices in your own classroom or school? Give the Neurodiversity Strengths Checklist (Figure 7.2) to one or more students in your classroom or school who have special needs. Communicate the results to other school personnel who work with the students. How does an awareness of strengths affect the attitudes that others have toward the students? Use the Appreciative Inquiry-IEP Protocol (Figure 7.3) in the IEP meetings of one or more students. How does the focus on strengths, hopes, and aspirations affect the dynamics of the meeting? What are your own personal images of what a "strength-based" classroom or school looks like? What practical steps can you take that will lead to the realization of your hopes and dreams for such a program? What other questions or reflections do you have about the material in this book that haven't been addressed in this Study Guide? How could you go about obtaining answers to these questions? 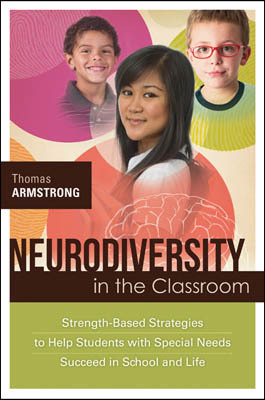 Neurodiversity in the Classroom: Strength-Based Strategies to Help Students with Special Needs Succeed in School and Life was written by Thomas Armstrong. This 188-page, 6" x 9" book (Stock #113017; ISBN-13: 978-1-4166-1483-8) is available from ASCD for $18.95 (ASCD member) or $24.95 (nonmember). Copyright © 2012 by Thomas Armstrong. To order a copy, call ASCD at 1-800-933-2723 (in Virginia 1-703-578-9600) and press 2 for the Service Center. Or buy the book from ASCD's Online Store.